Drive around any major Pakistani city these days and you can see the subtle signs. There is the logo of the Industrial and Commercial Bank of China (ICBC) on top of the tallest building in Karachi. There are the Chinese engineers having lunch at restaurants in Lahore. There is the proliferation of new Chinese small businesses in Islamabad. And, of course, there are the massive Chinese machines and armies of Chinese managers and workers that you can see across worksites throughout Pakistan, if you happen to get close enough to any one of the dozens of Chinese-funded projects that dot the entire country’s landscape. Whether we like it or not, Pakistan’s economic fate has now been tied to that of China, though how firmly – and for how long – may still be up for debate. What that means, however, is anybody’s guess as of right now. There is now at least somewhat of a debate as to whether the China-Pakistan Economic Corridor (CPEC) is good for Pakistan, at least among Pakistan’s small community of intellectuals who analyse such matters. If one looks hard enough in Pakistani publications, one might find an article or two assessing such questions as the extent to which borrowing from China may impact Pakistan’s macroeconomic health, whether investing in coal at a time of grave climate change and falling solar prices is a good idea (hint: it’s not), and whether any of the Chinese-financed infrastructure programs will improve Pakistan’s economic competitiveness. But a much more fundamental question has been avoided altogether: what does China actually want to get out of pouring this much money into CPEC? We know what Islamabad wants, and what it thinks it will get out of CPEC, but what does Beijing want? Does anyone in Islamabad know? Do they care to find out? We suspect the answer to the latter two questions is no. 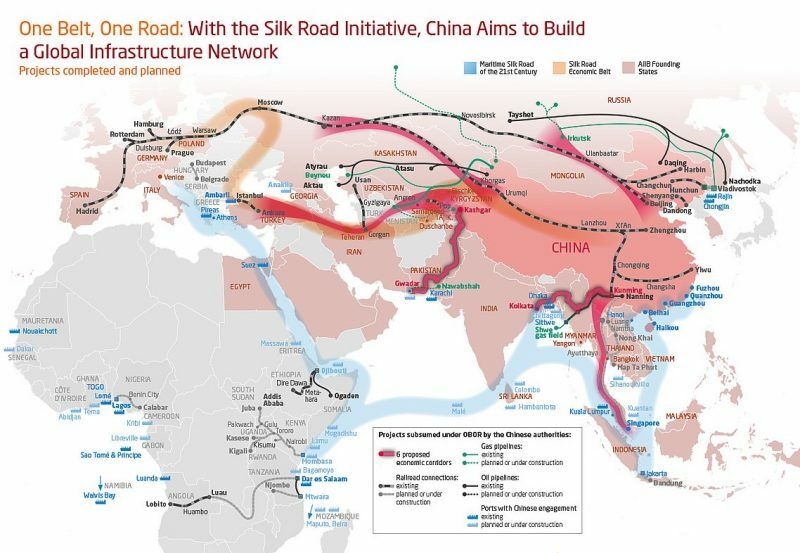 The government of China itself has, unsurprisingly, been less than forthcoming about why it is making such large investments in the Belt and Road Initiative (BRI) and why CPEC, which is not technically a part of BRI but still related, is the single largest component of the Chinese government’s investments in overseas infrastructure. Oh, sure, ask any Chinese diplomat, or comb through Chinese official statements and one finds the usual language about promoting peace and harmony and commerce and all that nice stuff. But really, what do they want? And what are we giving them in exchange for the money (besides the obviously high-interest rates and high prices on Chinese equipment)? It may be an uncomfortable realization for most Pakistanis that the world’s major powers see us as merely a pawn (and not even a lesser power), but the sooner we understand how we are perceived in the capitals of the world’s most powerful countries, the sooner we can understand their intentions towards us. Neither Washington nor Beijing has ever thought of Pakistan as a particularly important ally, and while both have occasionally made gestures to placate Islamabad’s desires in order to persuade the government of Pakistan to do what they want, neither sees Pakistan as the kind of indispensable ally that is worth taking on a few additional troubles for. This does not, of course, mean that this is how Pakistanis should see ourselves and our own nation’s place in the world. It does, however, mean that we will have to understand that the respect accorded to rising powers like India, Brazil, Indonesia, and South Africa will not naturally be extended to Pakistan as well, at least not until the government of Pakistan fights for it. It is in this framework that it is important to understand how great power machinations can affect both Pakistan’s political alignments and economic wellbeing, and how the country must craft its response. To understand the answer to the question of what does Beijing want, one must, therefore, understand the history of not just China, but also the United States, the place of each of these countries in the global economic and political order from the 20th century onwards, and how the changes in the relative power of countries can result in massive changes in global political allegiances and, more often than not, war. 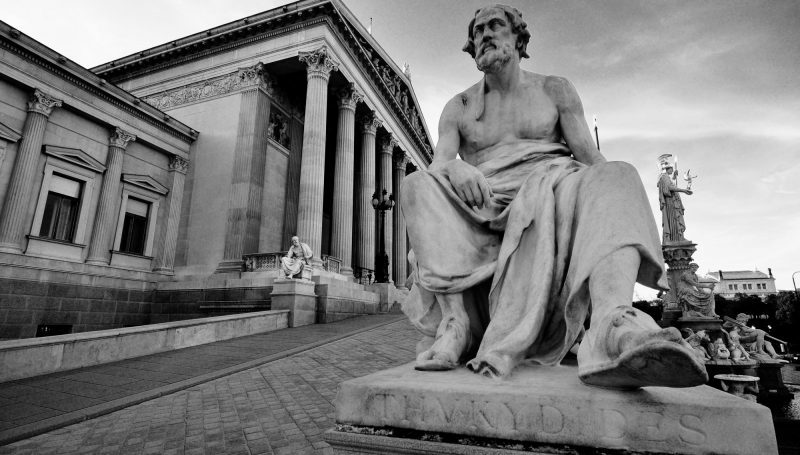 But first, a lesson in the history of Ancient Greece, and specifically the warnings of an Athenian historian who wrote about how the world can change when rising powers challenges reigning ones. In September 2015, The Atlantic magazine in the United States published an article by Harvard political scientist and former US Assistant Secretary of Defense Graham T. Allison, who warned that the United States and China are in danger of falling into the Thucydides trap, the near-inevitable cycle of mistrust that can lead to war between great powers as one rises and the other sees its power challenged. The theory was first put forward by the Greek historian Thucydides, who wrote the definitive book The History of the Peloponnesian Warsbetween Athens and Sparta for supremacy in the Eastern Mediterranean region in the fifth century BC. How is any of this relevant for Pakistan and its relationship with China? Because CPEC is not the result of the supposed friendship between Islamabad and Beijing, but rather the global chess match that China is playing against the United States. In this game, if the chess metaphor can be extended, Pakistan is at best a knight: maybe not quite a pawn, but an odd piece that moves even more oddly, and while it can occasionally deliver a good blow here and there, is usually only slightly less expendable than a pawn. In other words, if we want to understand what China wants out of CPEC, we need to understand the relationship between China and the United States in particular, and the relationship between rising powers and reigning powers more broadly. The United States has been indisputably the most powerful country in the world for a full century now, and in that time, it has built a global order that has come to define the world as we know it today. While American power is multifaceted and pervasive, there are three key ingredients upon which this power rests: a dynamic domestic economy that is more innovative than any other on the planet and can serve as the anchor of the global economy, a voluntary set of US-dominated global institutions that seek to export the US ideological model of liberal democratic capitalism throughout the world, and a military force that is deployed across the entire planet in services of keeping the sea lanes open for global trade and for keeping a lid on major power conflict. As China rises, it believes it has come close to achieving the first of those three prongs of US hegemony. Long derided as simply a hub for cheap manufacturing, China is now an economy that has grown to become the second largest in the world not just because it serves as a factory for the world, but also an increasingly important center for innovation and technological leaps forward. 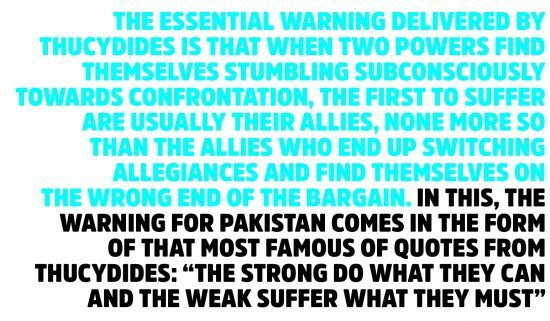 From Pakistan’s perspective, whether China has actually achieved this goal is almost irrelevant: the fact is that Beijing believes it has, or is close to, achieving this status, and has begun to act accordingly: namely, building out the other two elements of global power. Beijing has already begun to build up what is being billed as the Chinese answer to the Washington-based, US-dominated World Bank: the Asian Infrastructure Investment Bank, one of the entities that was originally meant to be the financiers of many of the CPEC projects before the Chinese government realized they were nowhere near ready to build the kind of specialized institution that could finance infrastructure around the world and instead got regular Chinese state-owned banks to do more of the financing instead. CPEC, however, is not meant to be a showcase for China’s equivalent of the World Bank. Instead, it is meant to challenge the most overt form of American power: its military might, which serves as the guardian of its economic power. 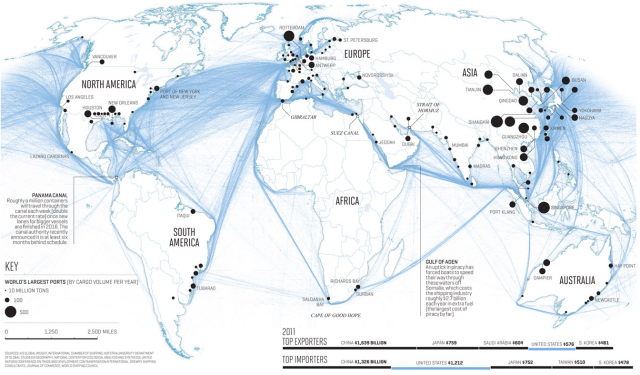 Look closely at the map of global trade flows and one sees that there are a handful of points that can be viewed as choke points in the global trade system: the Panama Canal, the Suez Canal, the Straits of Gibraltar, the Straights of Hormuz, the Straights of Malacca, and the Gulf of Aden, in addition to other points on the map, are narrow bodies of water through which large volumes of the ships that carry global commerce flow. At, or near, each of these choke points is a US naval base, or the base of a military with whom the United States is very closely allied. In Washington’s eyes, the United States Navy stands as the guardian of the safety of global sea lanes, and is the hard power that makes all of global commerce – including China’s explosive export-led economic growth – possible. While it is partly the act of a magnanimous global power, it is also fundamentally a self-interested act: if the United States is the country that makes the global economic system of trade possible, then the United States also gets to have a say in writing the rules of that system. It is that matter of the global trade rules – which the United States made, and which China is widely seen as being less than amenable to when they do not suit its interests – that is likely to be the trigger for conflict between these two global powers. China does not want to follow the rules of the US-led World Trade Organisation, in large part because they require a greater degree of openness and foreign competition than China is willing to allow for its domestic market. 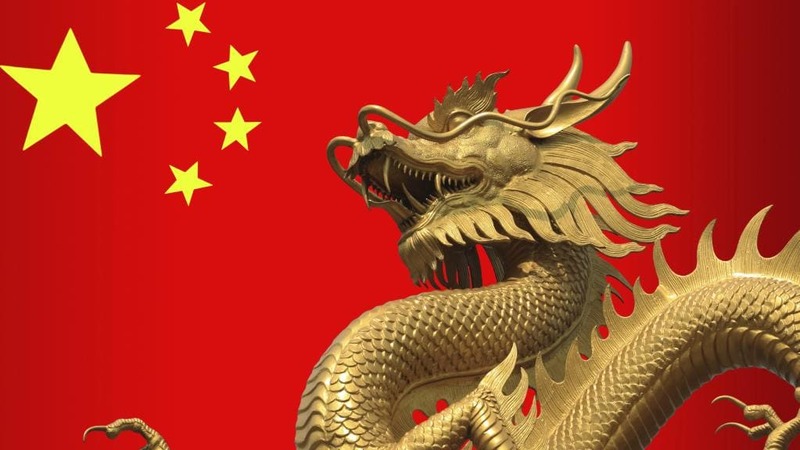 But China is now also the second-largest economy, which puts it in an awkward position: too big to continue flouting the rules without anyone noticing, but not big enough yet to change the rules to suit its interests. That is where the One Belt, One Road (OBOR) initiative and CPEC come in. The beginnings of Pax Sinica? The matter of China’s place in the global trading system had already begun to become a problem by the second term of President George W Bush, and continued to simmer along throughout the presidency of Barack Obama. It is now threatening to boil over under the leadership of President Donald Trump, who has made hostility to China on global trade a signature policy issue. But the leadership of China has been smart enough to see the problem coming, and appear to have designed a solution that would serve two purposes: reduce the United States’ power to make the global economic system’s rules, and increase the centrality of China in global trade. In order to reduce the power of the United States, the most obvious path would also be the one that would most directly lead to conflict: rather than letting the US Navy be the sole guarantor of security for all of global trade, China could start sharing that burden by creating naval bases close to those choke points for global trade as well. The problem, of course, is that two major global powers building large military installations in close proximity to each other is a recipe for disaster. Beijing may as well be issuing an overt declaration of war. So instead, China decided to adopt the strategy used by Persian Emperor Xerxes in his invasion of Greece: change the landscape altogether. Instead of challenging the United States for control of the choke points of global trade, China is seeking to remove those choke points altogether, by creating a combination of land and sea routes that eliminate the need to travel through those narrow bodies of water. That port would be connected by strong road and rail links to China and would create a backup to China’s current route for ships to and from Europe, which must pass through the Straits of Malacca. Instead, China would be able to redirect at least a portion of its trade to pass over land through southern China and Myanmar to reach the Bay of Bengal directly, bypassing the Straits of Malacca completely. 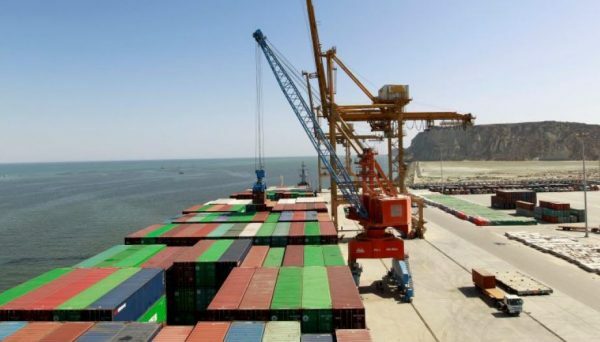 China’s interest in CPEC, and Gwadar, is a similar move: creating an opening to China from the Arabian Sea, which would have the added bonus of allowing goods to flow between China and the Middle East and Europe without having to pass through, or close to, Indian waters. 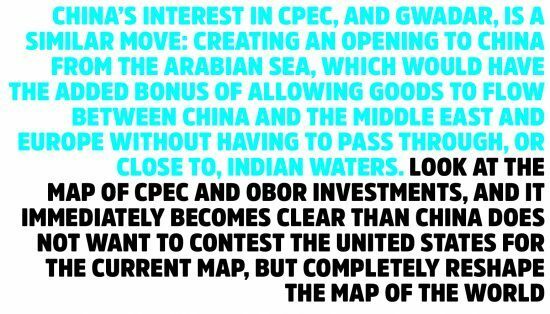 Look at the map of CPEC and OBOR investments, and it immediately becomes clear than China does not want to contest the United States for the current map, but completely reshape the map of the world. So what, you might be tempted to ask. It looks like China is avoiding war on its way to becoming a dominant global power, and it is developing Pakistan’s infrastructure along the way. What is wrong with that? Well, for one thing, it may be instructive to remember that this infrastructure is being built first and foremost for the needs of China. Any benefit that accrues to the Pakistani economy is purely incidental and not at all the goal of the projects. And secondly, and perhaps most importantly, it is highly relevant to remember the differences between how the United States and China have historically seen trade. The defining ideology of the United States is liberal democratic capitalism, which results in Washington believing, among other things, that creating mutually beneficial global trade relationships is the key to establishing a peaceful world order. Trade, in the American view, is meant to benefit all parties involved as a means of keeping the peace amongst them. By contrast, China’s view of trade has largely been one of a system that it has no problem gaming to its own benefit, and discarding when its rules become inconvenient. For another, it is also increasingly becoming clear that China wishes to own the infrastructure it is building in other countries, the most famous example of which is the fact that it has formally taken ownership of the port of Hambantota in Sri Lanka after the Sri Lankan government was unable to pay its debts. In that respect, this new relationship with China is more akin to colonialism than any other form of economic partnership. China’s vision for Gwadar, in other words, is likely to involve a lot more direct Chinese control than is currently being discussed. It is certainly not a promising sign that the government of Pakistan has thus far refused to disclose the precise nature of the terms under which all of the infrastructure projects are being financed. If the current administration truly believes in Pakistan learning to become an economically independent nation – as their rhetoric seems to suggest they do – then they may be inclined to try to move Pakistan out of CPEC and onto a more self-reliant path of economic development. After all, the first rule of economics is that there is no such thing as a free lunch. China is not acting out of the magnanimity of its heart in building this infrastructure. It is doing so for its own economic and national security needs, and the future of the people of Pakistan should not be ransomed to the needs of a country that is about to engage in a massive competition with another major power in its quest for global hegemony. We have worked too long, and too hard, for independence to voluntarily give it up now.